This is a historically significant album by this very short-lived group. Like a meteor that streaked by too fast, the New York Contemporary Five were one radical group. 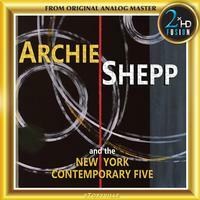 Tenor saxophone strongman Archie Shepp was always sticking his neck out, often over the cutting edge so when Shepp, Cherry and Tchicai met up with bassist Don Moore and drummer J.C. Moses, the writing was on the wall: free jazz. In no time at all, the NYC5 took to the studio and the stage, looking to challenge and bewilder anyone who happened to be present and everyone's sense of possibility was suddenly at a new level.